The minority groups that carried President Obama to victory yesterday by giving him 80% of their votes are on track to become a majority of the nation’s population by 2050, according to projections by the Pew Research Center. They currently make up 37% of the population, and they cast a record 28% of the votes in the 2012 presidential election, according to the election exit polls. 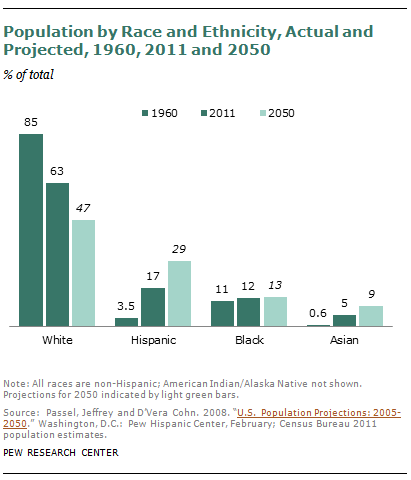 By 2050, the Hispanic share of the U.S. population could be as high as 29%, up from 17% now. The black proportion of the population is projected to rise slightly to 13%, while the Asian share is projected to increase to 9% from its current 5%. Non-Hispanic whites, 63% of the current population, will decrease to half or slightly less than half of the population by 2050. The forces behind this transformation are a mix of immigration, births and deaths. The United States is more than four decades into what has been, in absolute numbers, the biggest immigration wave in its history–more than 40 million arrivals. Unlike previous waves that were almost entirely from Europe, the modern influx has been dominated by Hispanic and Asian immigrants. These immigrants, like those from previous centuries, tend to have higher shares of women of childbearing age and higher birth rates than the U.S.-born population. Most of the growth in the Latino population and much of the growth in the Asian population will be driven by births rather than immigration. At the same time, the native-born white population is aging, and births to white mothers have been declining. The Pew Research population projection, first released in 2008, was based on the assumption that current trends would continue, including the immigration rates that had prevailed in recent decades. However, net immigration—especially unauthorized—has slowed since the Great Recession began in 2007. Under an alternative scenario that assumes immigration levels that are lower than those in the past (and somewhat lower than the current reduced levels), the same general trends are projected, but at a slower pace. Under the lower-immigration scenario, whites would make up 52% of the total U.S. population in 2050, not 47%. And Hispanics would be 26% of the population, not 29%. However, immigrants and their descendants still would account for the vast majority of the nation’s population growth by mid-century. The 28% representation of minorities in the 2012 electorate was an increase from 26% in 2008, according to the election exit polls. In 2008, voters from racial and ethnic minority groups also gave 80% of their votes to Obama. Demographic change will come more slowly to the voting-eligible population than the overall population for a number of reasons. First, many immigrants are not eligible to vote because they are not citizens. Also, the nation’s race and ethnic minorities are younger than the white population, so many are not yet old enough to vote. In 2011, according to Census Bureau population estimates, whites were 66% of those ages 18 and older, three percentage points higher than their share of the total population. Hispanics, the nation’s largest minority group, were 15% of the population ages 18 and older, two percentage points less than their share of the total population. But the voting-age population will continue to grow more non-white every year. Among the 4.4 million 18-year-olds in 2011, for example, 56% were white, 21% were Hispanic, 15% were black and 4% were Asian.